Barry Molloy has competed his move to Crusaders. 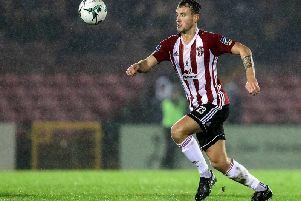 Former Derry City captain Barry Molloy has paid tribute to the Brandywell club and its supporters after completing a move to Danske Bank Irish Premier Division side, Crusaders. Speaking on his facebook page, Molloy - whose final appearance for the Candy Stripes came in November’s FAI Cup final defeat against St. Patrick’s Athletic - said leaving had been a difficult decision to make. “I want to thank everyone who supported me and made my life at Derry City a dream come true. From day one you, supporters, family and friends have been amazing to me. It’s been an incredible 10 years, with a lot of ups and down, but something I wouldn’t change for the world. “The memories will always be with me. The 2006 season, when we came so close to achieving the ‘treble’ along with the European adventure. Winning the first Division title and returning to our rightful place and winning the FAI Cup Final in 2012 to name a few. Molloy, who was Stephen Kenny’s first signing at the Brandywell, said he was emotional to be leaving his hometown club but was looking forward to a new challenge. “To every member of staff I’ve worked with, especially the players. Every single person connected to the club. You have been amazing and I will always be grateful for standing by me through thick and thin. “Emotional to think that my Derry career has ended. I have always given 100 per cent, in my opinion. I know I’ve never been the best player, but I always gave my all for my club.